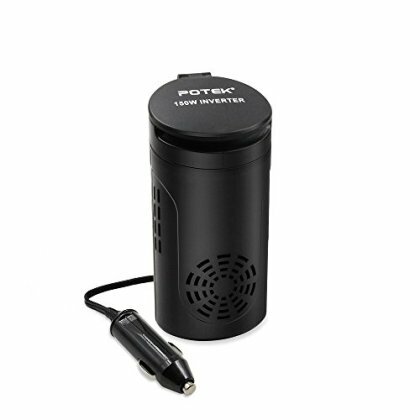 Portability: Cup holder compact design, directly plug in any 12V cigarette lighter socket. Idea for use on vacations,works on trips,and camping. 39 inches cigarette lighter plug makes the power inverter can be plugged into almost any vehicle. Smart Fan: Ultra-silence fan, Very quiet when it's working, only noticeable in VERY quiet condition after running constantly for hours, but still not distracting. The fan becomes quiet automatically when inverter cooled down. Smart fan helps reduce heat and prevents shortages. Mufti-Protection：Safe charging design provides protection against overheating, under and over voltage charging, short circuiting, overloads, and overcharging. Built-in fuse to protect your device. Worry-free 18-month warranty.